You know those pens that end up in your pocket or purse promoting JoeÕs Garage or NancyÕs House of Insurance? Well the sick minds at Fred have taken it one step too far with this sub-versive collection of immortal advertising keepsakes. 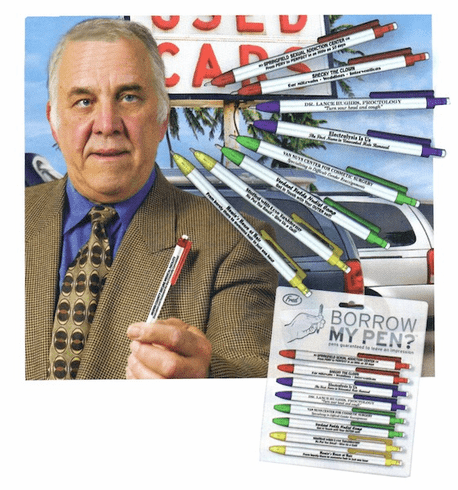 Hand Ôem out to your friends, your parole officer, your boss when you say "Borrow My Pen?" youÕll ALWAYS make an impression. Eight memorable styles.